We’d love your help. Let us know what’s wrong with this preview of Presenting to Win by Jerry Weissman. Thirty million presentations will be given today. Millions will fail. Millions more will be received with yawns. A rare few will establish the most profound connection, in which presenter and audience understand each other perfectly, discover common ground and, together, decide to act. To ask other readers questions about Presenting to Win, please sign up. You have to be good if you’re going to sell more than 100,000 copies of a book about how to be a better presenter. Jerry Weissman is good. And he gets to the heart of great presentation skills by reminding us, throughout this wonderfully engaging book, of the importance of story if we want to hold the attention of audiences at a time when attention spans are as ephemeral as yesterday’s tweets. Whether we're new to the art of presentation or are experienced presenter-trainer-teachers benefitting You have to be good if you’re going to sell more than 100,000 copies of a book about how to be a better presenter. Jerry Weissman is good. And he gets to the heart of great presentation skills by reminding us, throughout this wonderfully engaging book, of the importance of story if we want to hold the attention of audiences at a time when attention spans are as ephemeral as yesterday’s tweets. Whether we're new to the art of presentation or are experienced presenter-trainer-teachers benefitting from the useful reminders Weissman provides, he carries us through the presentation cycle with lots of guidance, including warnings of how we can go wrong: not offering clear points, not offering a clear benefit to our audiences (what's in it for them, not us), not creating a clear flow of thought and information in our work, offering more details than an audience can absorb, or creating presentations that last too long. I liked this book. Jerry Weissman presented a lot - and I mean A LOT - of different ways to improve presentations. I'm sure I will use the information from his book very often. 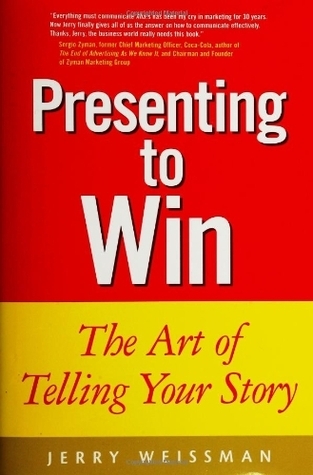 Before I started reading "Presenting to Win" I thought it might be yet-another-book-about-improving-yourself. But no, it's not saying "be confident, speak loud". It contains many general rules, but also many simple hints that will, I'm sure they will, improve the way I'm preparing presentations and showing them. Getting your story right is the key to presenting well and the writer takes you through steps to do this. Admittedly, I wanted more time on the topic and more examples. This is as close as I’ll likely get to attending his workshop, and there’s plenty to implement here! I highly recommend this book for those who want to improve their presentations. Despite the name - a good book with interesting and fun stories and some recommendations that are worth keeping in mind. Really enjoyed the focus on meeting the needs of the audience. Lots of very practical suggestions to improve presentations. This was a fantastic book. I'm not sure what drew me to it since I am not necessarily in a position where I give formal presentations very often and frankly have avoided using audiovisual aids in the presentations I have given. Prior to reading this book I couldn't have told you what an IPO was and I'm not in an industry where I'm likely to give presentations to investors or in a multimillion dollar industry. I have given presentations though and they haven't always gone the way I wanted them to. This was a fantastic book. I'm not sure what drew me to it since I am not necessarily in a position where I give formal presentations very often and frankly have avoided using audiovisual aids in the presentations I have given. Prior to reading this book I couldn't have told you what an IPO was and I'm not in an industry where I'm likely to give presentations to investors or in a multimillion dollar industry. I have given presentations though and they haven't always gone the way I wanted them to. Now I know why. I've committed almost every one of the "cardinal sins" or presentation, with and without A/V assistance. After reading this book, I feel much better prepared should the need for a presentation arise. In fact, I'm almost hoping that a chance to put these principles into action presents itself. I could also see many applications for the same information in other aspects of my personal and professional life. We are all "selling", whether it be a product, an idea or concept, or a relationship. We want others to get it, to understand us, and really we want them to agree with us or take a desired action. The way that we communicate that is critically important to whether we achieve our goal. All of these corporation-tested techniques explained in this book have many useful applications in life if applied creatively. What: what equipment do you need for the presentation? Presenting to Win was downloaded to my Nook library when Barnes and Noble offered it for free in October 2012. It uses PowerPoint 2003 and 2007 in its examples. PowerPoint 2013 is likely to adapt to those instructions. Weissman wants us to strongly remember the phrase, a presentation is not a document. The speaker needs more than Word to write a speech and PowerPoint for the graphics. He wants the speaker to be an audience advocate so that your message gets through to the audience before their e Presenting to Win was downloaded to my Nook library when Barnes and Noble offered it for free in October 2012. It uses PowerPoint 2003 and 2007 in its examples. PowerPoint 2013 is likely to adapt to those instructions. Weissman wants us to strongly remember the phrase, a presentation is not a document. The speaker needs more than Word to write a speech and PowerPoint for the graphics. He wants the speaker to be an audience advocate so that your message gets through to the audience before their eyes glaze over. Another important topic is the necessity of verbalizing your speech in practice, not simply disembodiment or mumbling. Linkages are meaningful verbal transitions from one slide to the next. Sometimes, the reader may think Weissman slows down too much, and this may be an indication Weissman is using spaced learning for a purpose. If you don't have the time for spaced learning, read the highlights from the last chapter, Appendix A and Appendix B.
I was interested in this book because I do speak in front of people on a regular basis (as a preacher, I am publicly speaking every week). I wanted to improve my presentation skills. The subject of presentations is specifically directed at the business world and not sermon or teaching. The main idea of a narrative presentation model is relevant. The method applies to any speaker who may need to improve their presentation in preparation, flow, and visual aspects. The book refers to older versions of PowerPoint presentation software, but they may still be in use. The great Brad Holaway gave me this book saying, "I've read it 3x already, here, take it, just read it." Pretty good book that pushes a main point: the What's In It for YOU!! Keys in on the idea of value: is a product, service, idea, relationship, etc. Valuable (worth something) The great Brad Holaway gave me this book saying, "I've read it 3x already, here, take it, just read it." Pretty good book that pushes a main point: the What's In It for YOU!! Keys in on the idea of value: is a product, service, idea, relationship, etc. Valuable (worth something). Then how does one go about presenting this Value to whomever is listening, reading, etc. what "I" am putting out. Great book if you are planning on giving any sort of presentation. I liked his emphasis on understanding the needs of your audience; what they care about, what they are interested in, the problems they face the dreams that they cherish and the biases that they hold. Then he asks the question...how can what you have (product, idea or service)give them what they want? This, of course, applies to business presentations as well as those that come up in personal and family life! He shows how to organiz Great book if you are planning on giving any sort of presentation. He shows how to organize a speech and how each section should tie in to the next. He gives ideas on how to use quotations and provides many of them throughout the book. Desde Leader Summaries recomendamos la lectura del libro Presentar para ganar, de Jerry Weissman. Las personas interesadas en las siguientes temáticas lo encontrarán práctico y útil: habilidades directivas, hablar en público y hacer presentaciones. Focus is on structuring a presentation; there's very little on bells and whistles, and, refreshingly, no chapter on how to use PowerPoint. Actually delivering the presentation is only touched on. Other books will have better info on that. One drawback: He's only focusing on one type of presentation, the type that's designed to persuade an audience to do something for you. (Here, it's usually investing in your business.) It takes a bit of a leap to apply his lessons to presentations that are desi Focus is on structuring a presentation; there's very little on bells and whistles, and, refreshingly, no chapter on how to use PowerPoint. I have conducted hundreds of seminars, attended the same number of client meetings, presented to investors and board members, and have lead various teams. 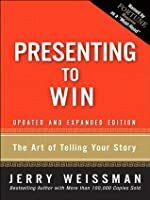 Presenting to Win has been my go to book for designing effective presentations that are concise, powerful and well-received. If you are in the a field that requires presentations this book should be the foundation for your approach and presentation. Useful, no-nonsense manual for creating effective business presentations. The author gives many useful tactics and ideas to help you create a narrative, organize your slides, customize for your audience, and design and animate the final presentation. While some of his case studies are a bit dated, many of Weissman's examples and "watch outs" offer a solid style guide for any modern presenter. Many of his principles are based on simple storytelling, perception, and audience psychology. Great how-to guide for how to perfect your presentation. The chapters are well organized and easy to understand. You can improve your presentations bit by bit adding an additional segment with each edit. The use of personal stories and references to current issues will bring participants into your realm of knowledge captivating their attention. Powerful reference tool which I will refer to often. This book was focused on business presentations, while my public speaking is geared toward community education and volunteer recruitment. That said, there are a lot of good tips in here about how to structure presentations to make them more engaging, and I will try to incorporate some of those ideas into my future talks. Solid 3.5 stars. In this book, Weissman provides some very helpful insight into structuring and framing effective presentations. I found some of the examples redundant, which took away from the book's appeal. One of the most helpful aspects was the comprehensive appendixes, which I copied and stuck in my tool kit for presentation preparation - many, many good reminders. This is an excellent aid to creating clear presentations. Weissman puts his principles into practice in the writing of the book itself. It is easy to follow and his main point of each chapter sticks with you. Here are his 5 cardinal problems with most presentations. A good overview of how to build a speech, with some very in-depth recommendations. There's nothing earth-shattering here, but it has some excellent reminders, and then really goes into detail around such things as slide design and connecting your various topics together. I can see this being an excellent workshop, but it just doesn't translate all that well to a book. Even the attempt seems to contradict itself. It's a basic book about the basics of making a good presentation. Should be required reading in B-school. This was a free kindle book so I figured why not...I wanted to do a little research this topic as I use PowerPoint quite a bit. There are some very helpful ideas in this book. Great advice about giving presentations. Totally changed my thoughts about how to structure a slideshow and create slides. Good information but a bit long winded and repetitive. Great book on the concepts to help someone learn how to properly present their ideas in a way that leads people forward. Many of the concepts make sense and will enhance anyone's presentations. Good content, though a little dry. I liked "Resonate" by Nancy Duarte better- similar content, but done better. Jerry Weissman is a leading corporate presentations coach. His private client list reads like a who's who of the world's best companies, including the top brass at Yahoo!, Intel, Intuit, Cisco Systems, Microsoft, Dolby Labs and many others. He is the founder of Suasive, Inc.